Saleh Al Kuwaity is considered the genius of his time whole music still lives on. He has made at least 600 compositions since he started his musical career in kuwait and then in Iraq, not only did he excel in the classical and popular music known at his time, but he created new styles of Maqam and developed the iraqi song to a higher level which gained great popularity with the public, his contibution to Iraqi music led him to work with leading Egyptian artists Muhammad Abdel Wahab and Um Kulthum. Along with his brother Daoud, a brilliant Oud player. They enriched music in Iraq and they became the founders of the musical ensemble of Iraqi radio. The event was the centenary celebration of the birth of Saleh Alkuwaity held at School of Oriental and African Studies (SOAS) on 3rd December 2008. The event comprised a full day conference commemorating Saleh Alkuwaity and his music followed by an evening performance by Ahmed Mukhtar and ensemble, Ismail Fadhil and musical group. 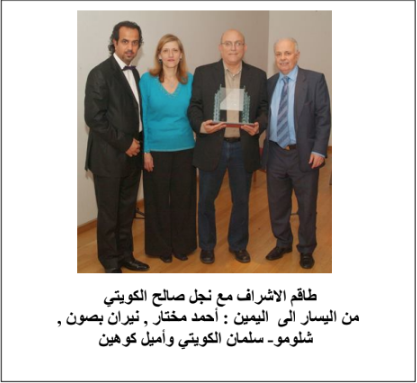 It was attended by Shlomo Alkuwaity, son of Saleh and he participated in the programme. The hall of the meeting was the Brunei Gallery and the evening performance was attended by about 250 people who applauded all the way through. The whole event was a great success with CDs and DVDs made of the evening performance and sold to the public. The singer Ismail Fadhil who came from Australia especially for the event achieved great stardom, following his performance, and there was a great deal of satisfaction expressed by both the audience and organisers of the event. The objective of introducing Saleh Alkuwaity to the Iraqi public as the leading composer of the Iraqi traditional music was fulfilled as well as promoting the musical heritage of Iraq. Perhaps what was even more gratifying was the audience participation, erupting with joy in a completely spontaneous way, acting in unison as Iraqis, despite the different denominations present and the serious divisions taking place at the time in the Iraqi society. It was felt that art can and had overcome the differences between peoples and music is one of the biggest unifying factors in bringing peoples together. The organisation of the Alkuwaity Event was undertaken by Ahmed Mukhtar, artistic director, Emile Cohen as Project Director and Niran Bassoon Timan as lead organiser and presenter. After the Alkuwaity event at SOAS in 2008, and the success achieved, it became necessary to maintain the enthusiasm of the group and preserve the legacy of Saleh Alkuwaity. His music and compositions were drawing high plaudits from all over the world and his name as a composer became well recognised, having been marginalised for decades by the Iraqi governments under the guise of Iraqi Musical Heritage. So, we started a website and collated all the articles, clips and videos so that others can abstract information for the enthusiasts in their musical pursuits, students writing a doctoral thesis, journalists seeking factual information, speakers giving lectures on music etc. A website was born but followed by other websites elsewhere. Concerts were performed in many countries dedicated to Saleh Alkuwaity music. This legacy of Saleh Alkuwaity, together with his brother Daoud is to be preserved through this website which we have now reformatted to give it a modern look and to make available for free the videos and clips. We look forward to your enjoyment.